Poster produced by London & North Eastern Railway (LNER) to promote rail travel to the East coast of England. 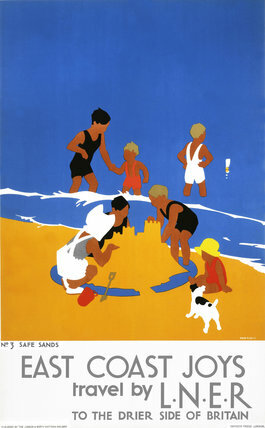 This poster, entitled 'Safe Sands', was third in a series of six posters illustrating the various pastimes that could be enjoyed on the east coast. The posters formed a continuous scene when placed next to each other, but each was designed so that it could also stand alone. Artwork by Tom Purvis (1888-1957), who rallied for the professionalisation of commercial art. In 1930 he was one of the group of artists who founded the Society of Industrial Artists, which campaigned for improved standards of training for commercial artists in order to broaden their scope of employment.